The Nubble! 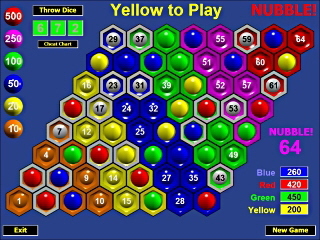 64 board runs from hexagons 1 to 64 and the game is played with three 8-sided dice. Nubble! 64 includes a 'Headstart' option in which between 5 and 25 hexagons are randomly covered over at the start of the game. This means that pupils are immediately immersed in the heart of the game and a full game can be completed quickly at the start or the end of a lesson. Make the most of this fantastic way for your pupils to practice their times tables. "Your pricing seems very fair and the fact that once we had paid for the enhanced licence children had home use is brilliant. Parents love it and it has become a selling feature of the school. This is very important in times of falling rolls and schools should be encouraged through their open days and promotional information to let parents know what will be offered to their child once they sign up to join the school."